We have a lot of birthdays in our family — from May – August, we have one a month (or more, if we extended outside of our house) — so we eat a lot of cake. It’s a bit of a challenge to come up with distinctive and unique cake choices (and we all have our preferences). For example, usually I have a chocolate on chocolate cake for my birthday. Then I try to make something creative (but not too adventurous) for P.’s birthday. The boys usually opt for something somewhat conservative. This year, I tried to come up with something extra-tasty for P.’s birthday, but not too decadent since it’s on the heels of the ultra-chocolatey Almost-Fudge Gâteau that we had for my birthday. After extensive research, I found this cake on the Cook’s Illustrated website. I particularly liked that it had a whipped cream-based frosting since rich chocolatey cakes are sometimes pushed over the richness edge by overly sweet, overly heavy buttercream or cream cheese frostings (yes, I know — it sounds crazy but it’s true!). I served it at P.’s birthday dinner — everyone present loved it, but P. in particular said he enjoyed dessert even more than the dinner itself (and he’s not a sweets guy). He had his slice alongside a scoop of my homemade coffee ice cream. I myself thought it was moist and chocolatey and all the things you want in a good chocolate cake. 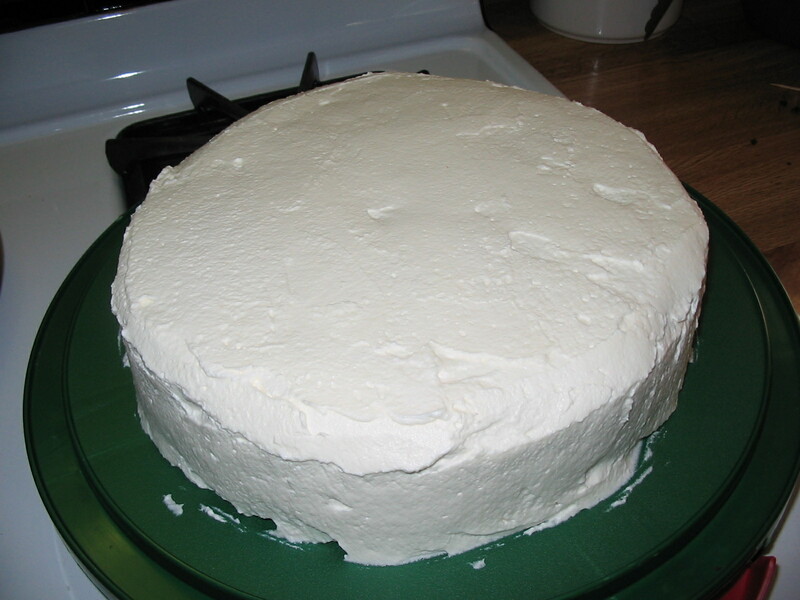 This cake blew the King Arthur Flour Devil’s Food Cake (that I made a couple months back) away. Sadly, it didn’t last very long — I barely had the chance to take a picture before it was gone! C. was having a hankering for rolls, as he calls them, and asked me to buy some. But why, I asked, when I can bake them instead? I found this recipe in my King Arthur Flour Baker’s Companion. I really slapped the first attempt together and they turned out beautifully. The dough is very wet, so I strongly recommend using a bread machine (or a stand mixer) to knead it (as I did for my second batch) — it’s very hard to work with by hand. The end result is a slightly sweet, very tasty bun — C. likened them to Portuguese Sweet Rolls (which he loves). Recently I discovered a new product at my local Asian supermarket. It’s coconut milk, but packaged in one of those long-life UHT cardboard boxes. When I used it (to make curry) it smelled so real, so much like fresh coconut cream, I was amazed. Up to this point I had been happily using powdered coconut milk, per my mom’s recommendation. But I am loving this Aroy-D brand coconut milk in a box. 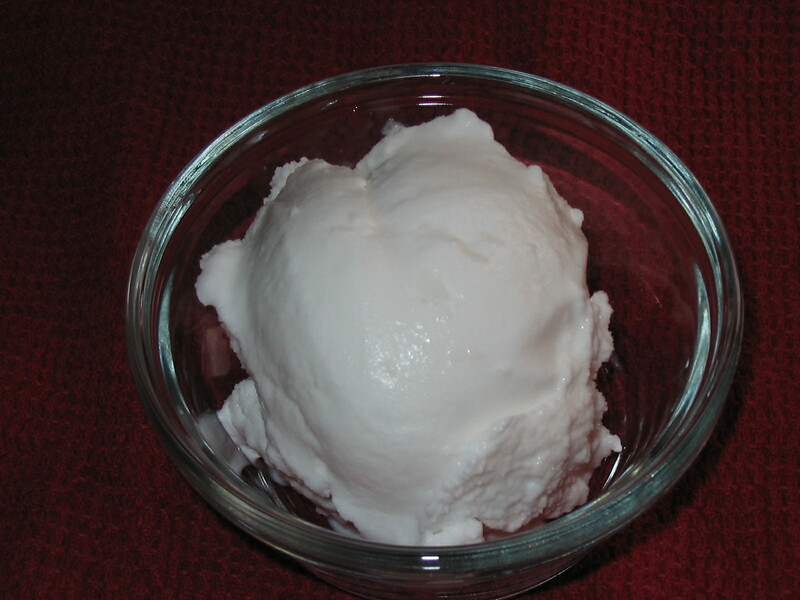 So inspired by this new discovery, I came up with this recipe for coconut ice cream. (And I was also inspired by a desire to get rid of a partial package of sweetened coconut that was living in my freezer!) It’s got me thinking about other coconutty ice creams — Almond Joy ice cream, anyone? In a medium bowl, use a whisk to combine the coconut milk and granulated sugar until the sugar is dissolved. Stir in the milk. Return mixture to the refrigerator to continue chilling. Turn machine on, pour mixture into freezer bowl through ingredient spout and let mix until thickened, about 20 minutes. Add the shredded coconut and continued mixing for another 5 minutes. Put finished ice cream into the freezer for another 2 hours to “ripen.” Enjoy! Here is a picture of the ice cream we made yesterday. In a medium bowl, use a whisk to combine the milk and granulated sugar until the sugar is dissolved. Stir in the heavy cream and vanilla to taste. 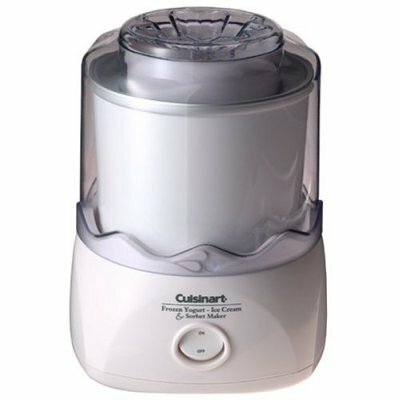 Turn machine on, pour mixture into freezer bowl through ingredient spout and let mix until thickened, about 25 – 30 minutes. Add the chopped chocolate pieces during the last 5 minutes of mixing. I haven’t been baking much the past week, due to the late spring heatwave we’ve been experiencing around these parts — 4 solid days with temperatures over 90 degrees F. Last Tuesday, the high was 101! The school superintendant urged parents to dismiss their children due to the oppressive heat in the schools, so I did. With that in mind, I bought myself a birthday gift (actually from P.) on Thursday — an ice cream maker. So in honor of Father’s Day, we made our first batch of ice cream this afternoon — a little something I call milk chocolate bit (they’re too small to be chunks, and they aren’t shaped like chips) ice cream. 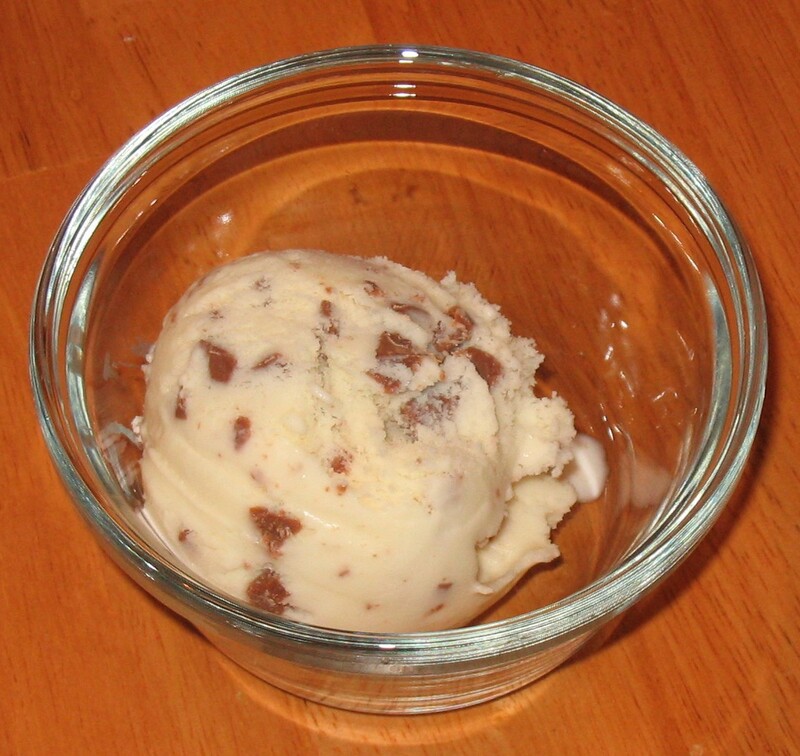 It’s a basic vanilla ice cream recipe with chopped up Cadbury’s Dairy Milk thrown in. It was yummy — creamy, smooth, very, very pleasing. It got me to thinking about all the other ice creams I can attempt! I took another stab at scones this morning, using yet another recipe. They turned out beautifully — moist, tender and not greasy like my previous attempts. And beautiful to look at too. This recipe is definitely a keeper. I also liked the cranberries (rather than the raspberries as in previous attempts) — no seeds! Blend flour, sugar, baking powder, salt, and butter. Add cream, egg, cranberries and white chocolate chips. Stir until dough begins to hold together. Turn onto lightly floured board. Knead for 2 minutes. Pat into 1/2″ round, cut into 8 wedges. 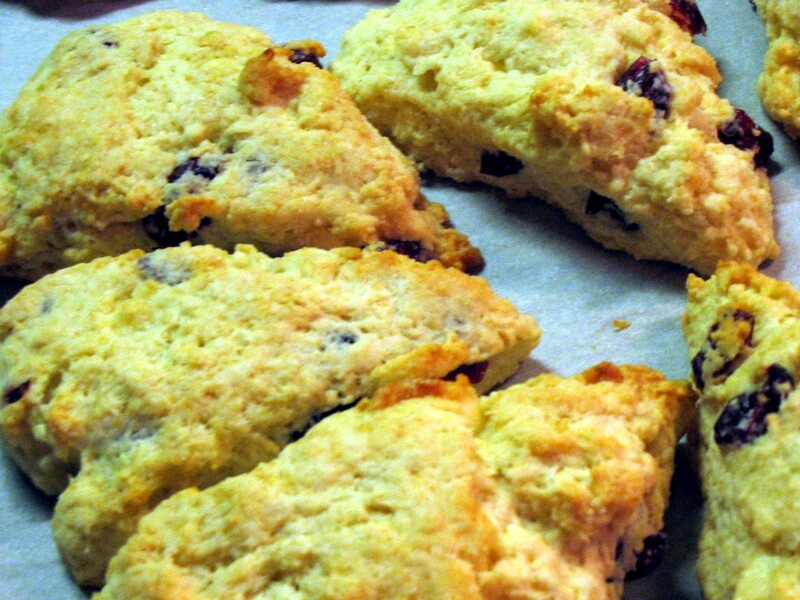 To make mini scones, divide the dough into 2 rounds and cut each into 8 wedges, making 16 total. Transfer to baking sheet lined with parchment paper. Bake at 400 degrees for 14 minutes until golden brown. Adapted from The Inn at Barnum Point recipe. Another guest baker today, my 13-year-old. L. had to make dinner as a class project and had originally planned this as the starter. However, real life intervened and he had to delay the dinner by one day, so he made these for us early. These pretzels are an adaptation of the Hot Buttered Pretzels recipe from the King Arthur Flour Cooking Companion, and were topped with garlic powder and coarse sea salt. YUM! I wasn’t in love with my last attempt at scones so I thought I’d give it another go. 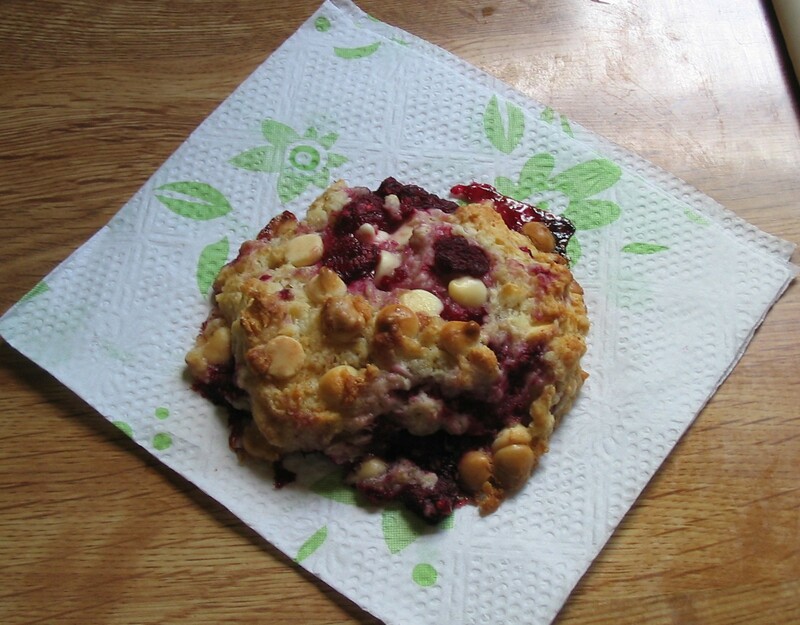 I had another scone recipe kicking around in my files and liked the idea of the yogurt instead of the traditional cream. Given the yogurt, I’m not sure how authentic a recipe it is, so maybe they are “scones,” rather than scones. These “scones” are moist without being greasy (unlike my previous attempt). The picture above is actually of an ugly one — it was the first one I ate! Preheat oven to 375 degrees F. Line a cookie sheet with parchment paper. Combine the dry ingredients in a large mixing bowl. Cut the cold butter into the dry ingredients, using a pastry blender, until it is the size of small peas. Whisk together the milk, yogurt, egg, and vanilla in a small mixing bowl. Add to the dry ingredients, along with the frozen raspberries and the white chocolate chips, mixing just until the dry ingredients are moist; the dough will be soft and the raspberries and chips may not be well-incorporated. Scoop 1/3 cup of dough (using a measuring cup as your guide) for each scone on to your cookie sheet. You will need to use your hands to gently form the scones and make sure the chips and raspberries are making good contact with the scone blob. 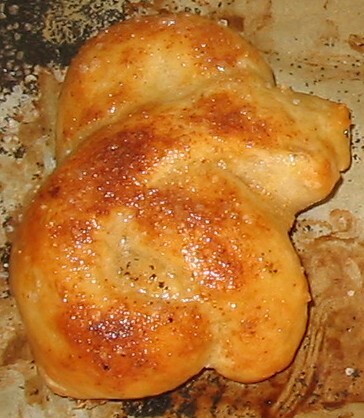 Bake for about 25 – 30 minutes or until golden brown. Let cool on cookie sheet for 15 minutes before serving. Makes about 1 dozen scones.